A little over a month ago I went with my friend Kanon to the opening of the remodeled Audi dealership in south Kansas City. At the opening, the dealer had a limited edition Audi R8 V10 Cabriolet, with a base starting price of around $175,000.00. While talking to one of the sales reps, I jokingly asked, “So how do you finance something like this? Your monthly payments would be insane.” Her reply was simple, “People that buy this car, bring in a cashiers check, or do a fund transfer from one of their accounts to ours. They don’t finance.” She went on to comment that the price of this car to the people who can afford it, think of $175,000.00 plus, kind of like most people think of $1750.00. That comment got me to thinking at the time about the abstract concept of money. I mean if your net worth is say 400 million dollars, well then yeah, 175k is a drop in the bucket to you. All of this leads me to today’s blog post, which was inspired by the folks over at Information Is Beautiful. 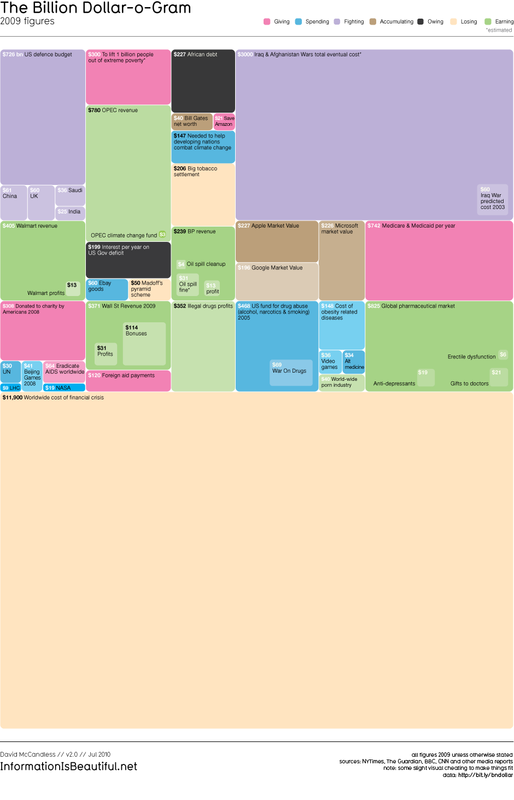 Information Is Beautiful posted a wonderful infographic on the cost of things on a world-wide scale. Things like the BP oil spill, the cost of the war on terror, and the world financial crisis. The whole thing is broken down into costs in billions of dollars, and it’s pretty impressive. It still doesn’t get my head space to full comprehend being able to walk into the Bugatti dealership and drop a cool 2 million plus on a Veyron, but it does help show the relationship of costs on a larger scale. Posted in Information Graphics and tagged Debt, Finance, Information Graphics, Money on July 18, 2010 by Author. ← Panasonic Headphone Packaging is Music to My Ears.